Fog-harvesting nets have been deployed by villagers in a semi-arid region of Morocco. CloudFisher is the invention of engineer Peter Trautwein of the German Water Foundation. The CloudFisher installation can harvest up to 600 liters per day, per net. The CloudFisher was developed by the German WaterFoundation. The steel frames and net holders were tested by the Foundation on Mount Boutmezguida in Morocco for a period of 18 months. Together with researchers from the Technical University of Munich, the Foundation tested different synthetic and stainless steel fabrics regarding their water yield. SF writer Frank Herbert wrote about this same idea in his 1965 novel Dune. Most of the novel takes place on the planet Dune, which has no liquid surface water at all. In order to plant vegetation, special materials are used to create dew collectors, to gather even the tiniest amount of moisture. 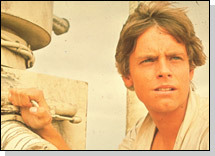 Fans of classic Lucas-created Star Wars will remind me to include a reference to the moisture vaporators of Tatooine. Read more at the CloudFisher project website.